Posted on Sat, Apr 21, 2012 : 5 a.m.
Margery Allingham, an English crime writer best remembered for her stories featuring sleuth Albert Campion, wrote about her hero, "He did not arrive at this conclusion by the decent process of quiet, logical deduction, nor yet by the blinding flash of glorious intuition, but by the shoddy, untidy process halfway between the two by which one usually gets to know things." At the bridge table, it doesn't matter how you get to know things -- as long as you find the winning play. How should East deduce what to do in this deal? South is in three no-trump, and West leads the diamond two. It is almost de rigueur in no-trump to return your partner's suit as quickly as possible. But a good detective doesn't do anything without first analyzing the evidence. What does West's lead tell East? That West has only four diamonds and, therefore, that South has five diamonds. It is rarely right to plug away at declarer's longest suit. East should win the first trick and shift to the spade four. Here, this works well. 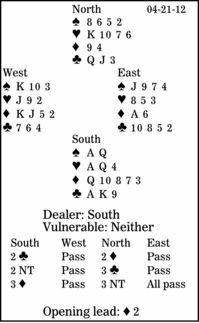 South's queen loses to West's king, and West returns the spade 10, the higher of two remaining cards, to declarer's ace. South can cash his eight top tricks. But if he plays on diamonds, the defenders will take three spades and three diamonds for down two.